Back in mid-2014, when we were selling our house in preparation to move to Boston, I made a declaration that I never wanted to own a house again. The amount of work we’d done on that house in nine years had me frustrated – replacing the roof, siding, and windows; digging up the entire front yard to deal with a broken pipe; repairing floors and bathrooms; painting and re-texturing and replacing appliances and digging up dead trees and who knows what else. It felt like we’d put a ton of money into that house and had nothing to show for it when we sold, and it had been much the same at our previous house when we lived in Wisconsin in the early 2000s. We found a large apartment that allowed pets in Boston, and went back to renting for the first time since 2002. Of course, I re-discovered quickly that I dislike renting more than owning. We had three more moves after Boston, and in each one, bought the house that we eventually moved into. Part of that was space necessity – it’s difficult to get apartments bigger than two bedrooms – and part was because of our cats. Then there’s the fact that everywhere we’ve lived, except Boston, it was cheaper to buy a house than rent something. Even now, when we had to pay more than twice the price of our original San Antonio house because the market exploded here in the last three years, it’s cheaper by several hundred dollars per month to own. But that does mean that all repair expenses land squarely on our shoulders. We bought this house in August. It’s a little over 20 years old and in fairly good condition. We had to replace the water heater because it was leaking, and we chose to replace the dishwasher because it was old and didn’t work well. Recently we had to replace the roof (sigh), which was something we’d hoped to avoid for another five years, and due to the same leak issue, we still have to replace part of the kitchen ceiling. (At least insurance covers that last one.) The kitchen lights are partially replaced, and eventually we have to replace the tile in the master bathroom. All that in under seven months. And now we’ve started on the front yard. Our property slopes from the road all the way down to the back fence. It should be terraced into tiers to prevent erosion, but no one ever did any major work on it. 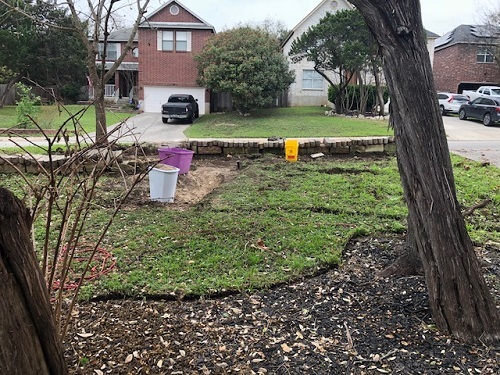 We have a tree in the front yard whose roots were showing on one side because of the erosion, so Jason and I have been working on how to landscape in a permanent but cost-efficient way. We drew up plans (he found an app to do this, which made the nice drawing above) and the boys started digging this week (woohoo spring break!). We already have a lot of rocks around our yards, so hopefully we won’t have to buy too much to get this work done. Just like the last two times we did a bunch of construction on our house, I might be writing a few progress posts as we go along, and posting pictures on my Instagram. Hopefully we can get the bulk of the front yard done before it gets too hot, which will be quite soon here in south Texas! 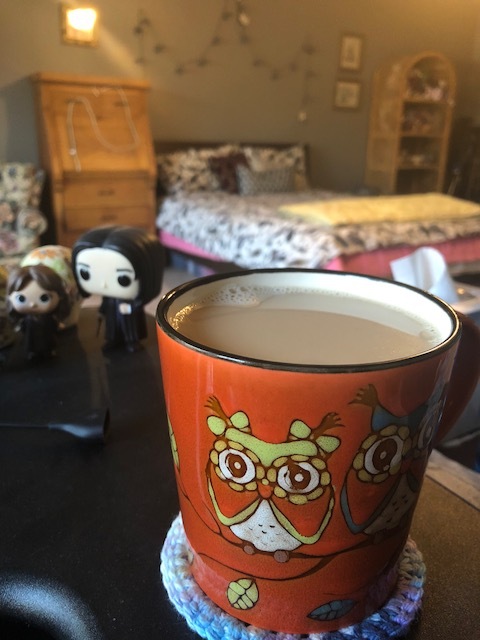 This entry was posted in Personal and tagged house, I made a thing., Sunday Coffee. Bookmark the permalink. I’m very bad at all this. 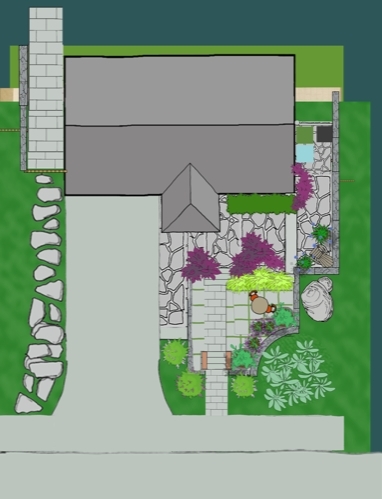 I hope it ends up looking as nice as what Jason is picturing! Yeah, our tax refund and Jason’s bonus this year went to paying for the new roof. Maybe next year we’ll actually get a vacation! *snort* We have three indoor kids and it’s like pulling teeth to get them to do this, but we made them do it anyway, haha. There were a lot of bribes.